Let your Holiday Magic begin here!! Let Magic Dreams be your home for that Dream vacation! 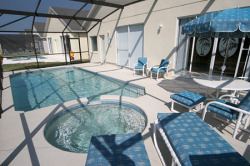 Our executive Florida villa offers luxury living in spacious and well-appointed surroundings. The property features four bedrooms, three bathrooms, lounge, family room, fully fitted kitchen, and separate utility room, making it the ideal choice for groups of 8 to 10, or two families sharing. The outside deck area houses a good-sized swimming pool and spa, which provides the finishing touch to this superb villa. A Games Room with 8 foot Pool Table, Foose Ball, Air Hockey and Darts is provided. With the Disney theme parks 6 miles west of Glenbrook (less than a 10-minute drive away), and less than 30-minutes drive to Seaworld, Universal Studios and Universal Islands of Adventure, you would be hard pushed to find a better location, whilst still being far enough away to relax and unwind. Glenbrook is a 30-40 minute drive from Orlando International airport, and around a 1-hour drive to Tampa. With its closeness to the 192, which is just South of Glenbrook resort, Magic Dreams is only minutes away from a wide variety of shops, malls & restaurants. For dining out, you are spoilt for choice, with a range of restaurants that cater for all tastes and budgets, so if it is that special night out just for two, or a big family meal at McDonalds, you won�t be disappointed! Orlando has an incredible choice of shopping experiences, from the small shops and markets along the 192, to the Supercenters and the Malls. We can�t list everything here (there are 60 restaurants within a 5-mile radius of Glenbrook for example), we can only give you a taster of what to expect. A comprehensive list, with location maps, is included within the WELCOME PACK that we send to you when you book our villa. Glenbrook Resort offers an on-site Clubhouse, with communal swimming pool, fully equipped Gym, Games room, large lounge with TV, Wi-Fi internet access, Tennis & Volleyball Courts and a 24-hour reception facility, all of which is free of charge to our guests.